We will email you homes able to accommodate sailboats and motor boats. Some homes have a pool others may have room to put in a pool. The approximate cost to install a new in ground swimming pool varies from $25,000 and up. There are hundreds of other waterfront homes listed, but we eliminated some because they had narrow waterfront frontage on pie shaped lots. Let us know which ones interest you and we will research and send you lot dimensions and seawall length. NOTE- the roadway at Floramar Terrace has a height of approximately 10 ft at low tide and approximately 7.5 ft at high tide. Enter the address of any property and the final destination. Many of the canals in Pasco County have direct access to the Gulf of Mexico. We have serviced many buyers who had 40 to 60 foot sailboats. They required room to turn around in the canal and need draft clearance from 5 feet plus. Our team does the detailed research and relays it to you. We are experienced with deep water homes on the west coast of Florida. We are a team of Buyers Agents at Charles Rutenberg Realty, Florida's largest real estate office. We represent buyers. Our team is experienced with all the homes in the area. Pasco County Florida is just north of Pinellas County. 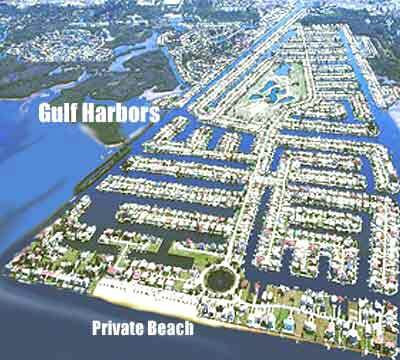 You'll find many desirable and inexpensive waterfront communities with a variety of waterfront homes that have direct Gulf access. It is approximately a 45 minute drive to Tampa International Airport. Typical asking prices are much lower than neighboring Pinellas County to the south. 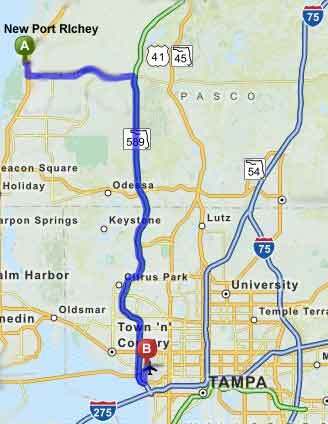 Pasco is approximately 30 miles northwest of Tampa and about 15 miles to Mid Pinellas County FL. You will find some of the least expensive waterfront homes in Florida on this web site. These are not cheap homes or the cheapest homes that are rundown. All are worthy of your review. If you have a sailboat, catamaran or large boat that needs deep water and wide canal for turnaround then remember to click the overhead birds eye view maps within each of the listings. If you have any questions contact us and we will be delighted to assist. ©Copyright WaterfrontFloridaHome.com All Rights Reserved. No duplication permitted!